Another solid concert announcement for the Lawrence area comes in today as Okkervil River will be making an appearance at The Bottleneck on September 12th. 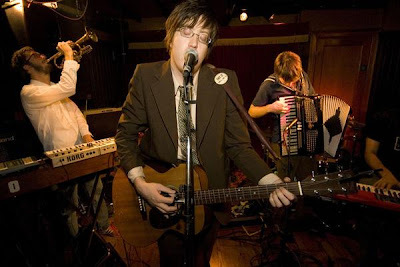 Okkervil River has been a JoC favorite now for a while....we've mentioned their solid 2007 album The Stage Names on here before and in fact, that album cracked our Top 15 Albums of 2007. This Austin, TX band just announced details for their follow-up/companion album to The Stage Names. The new album will be titled The Stand Ins and you can head over to Pitchfork to view details and full tour dates.